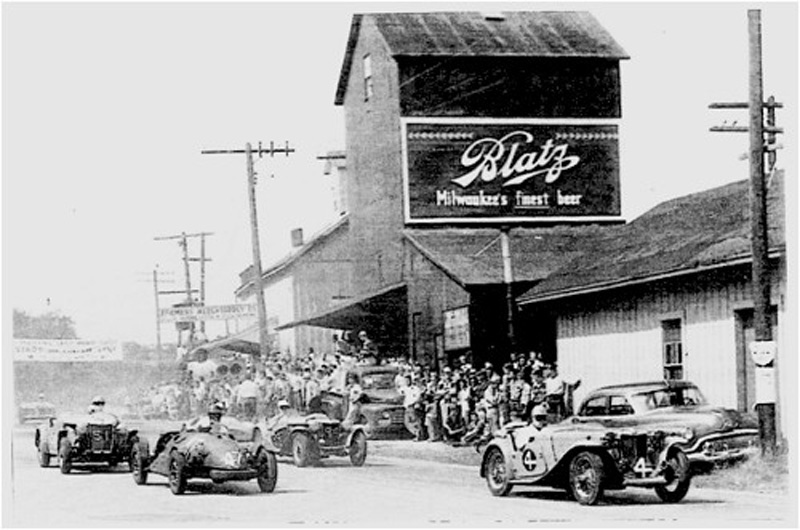 This website is a tribute to the early days of sports car club racing, and how the small village of Elkhart Lake, Wisconsin played a big part and still does today. In 1950, road racing happened upon the right place at the right time for a town on its last legs. Sports car owners and club members from Milwaukee and Chicago were looking for a good venue to race. The first race weekend was a huge success for the fledgling Sports Car Club of America and local residents of the village. America's new love of European sports cars and road racing, found a home in a remote Wisconsin community, and hasn't left since. It gave birth to a world-class racing circuit, Elkhart Lake's Road America. The Village of Elkhart Lake is a small town of less than a thousand residents and a quiet summer resort area in east central Wisconsin. It is about 1-hour north of Milwaukee, and some 2 1/2-hours north of Chicago. 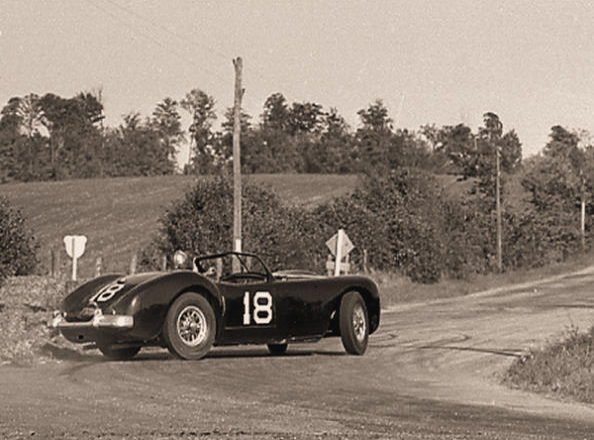 In late 1949, a group of sports car enthusiasts from the Chicago Region and Milwaukee Region of the Sports Car Club of America (SCCA) began looking for a location to hold a road race on public roads. There were no permanent tracks for road racing at the time. Jim Kimberly, a Chicago resident and SCCA member, grew up in nearby Neenah, WI and suggested the roads around Elkhart Lake. Kimberly arranged a flight for several members to show them the roads. Looking down from an airplane they studied nearby roads, which seemed good for sports car racing. The group of sports car club members landed at a nearby airport and hitched a ride into Elkhart Lake. They met with village leaders and talked about hosting a road race. At the time, Elkhart Lake was in economic decay after the closing of a canning factory put many villagers out of work. Local leaders felt the races would help revive things. Their answer to the car club group was a resounding yes. 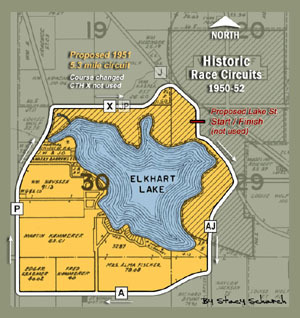 Planning quickly got underway for the very first Elkhart Lake race and planned for the following year on July 23, 1950. Many enthusiastic residents pitched in and volunteered to help and prepare the village for a sports car race. 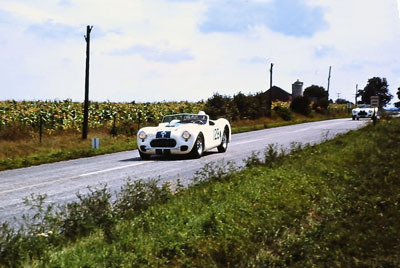 The open road sports car races held in 1950 through 1952 were conceived and conducted by the members of the Chicago and Milwaukee SCCA Regions. 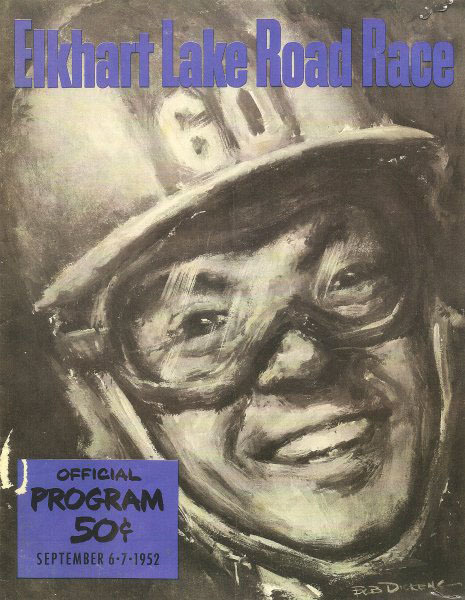 Jim Kimberly is acknowledged as the person who selected Elkhart Lake and was the driving force behind organizing the races along with Fred Wacker, Karl Brocken and C. Bayard Sheldon. In 1950, a series of roads were selected by early SCCA organizers for race circuit that was 3.35-miles long. The course was located on the north side of the lake and County Trunk Highway X in Section 19 of Rhine Township. 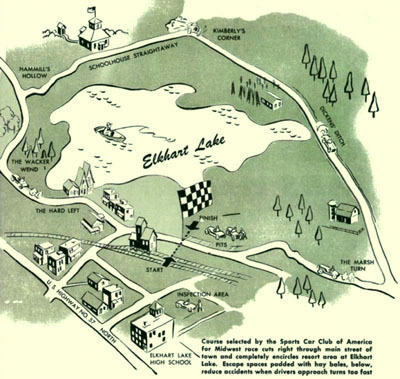 The start/finish line was on CTH P for Elkhart Lake's first race held on Sunday, July 23, 1950. Following the success of the first year, the circuit was changed to make the race events more interesting. The racing committee picked a new 5.3-mile route for the upcoming year, which went through the village and circumvented the lake on the south side of CTH X in Section 30. 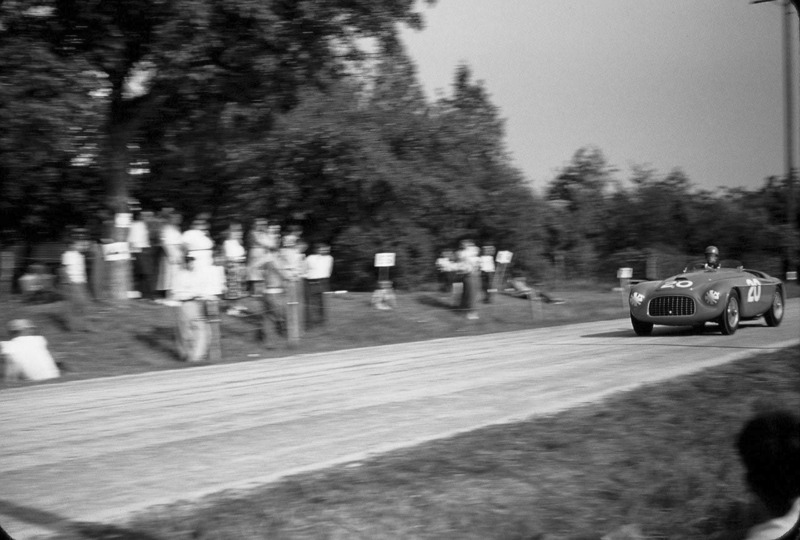 But, the course was changed just before the 1951 race, because CTH X was considered too dangerous by drivers. A revised plan was developed and excluded the treacherous highway, which was previously used on the old circuit north of the lake. The decision was made to add the old circuit to the new route, where it was divided by CTH X. The total circuit length was increased to 6.5-miles and traversed both Sections 19 and 30 through the Rhine Township. The start/finish line was located on CTH P for the 1950 races only. The course went north to CTH J and made a right at Marsh Turn, continued east-southeast on CTH J directly toward the village but made a sharp right at Ted's Turn (about 130 degrees) onto CTH X (now JP). The road swept through Peck's Alley and Brigg's Bend onto a short straight heading west. The last turn was called the Hard Right, which returned back onto CTH P and ran north to the finish line. 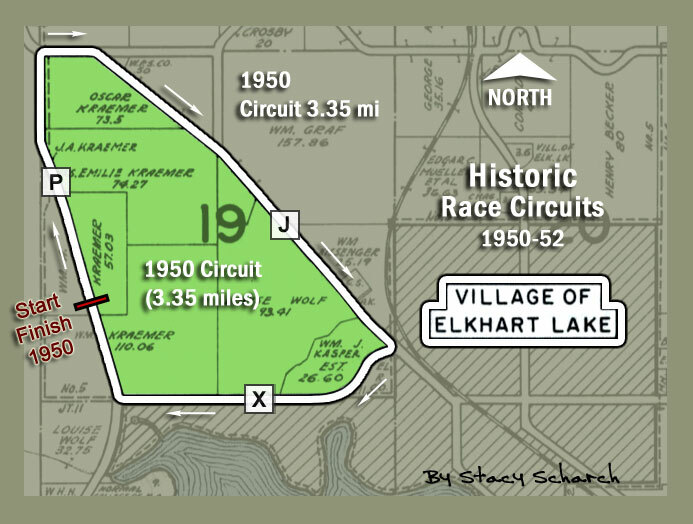 The first Elkhart Lake circuit (3.35-miles) was only used in 1950. Located west of village in Section 19 of Rhine Township. Start/Finish was going to be located in town on Lake Street. Cars would run south through streets and find their way onto CTH AJ, then west on CTH A, north on CTH P, east on CTH X (now JP), right on CTH J heading back into town on Gottfried Street, then right on Lake Street across start/finish to complete a lap. However, the course was changed at the last minute before the start of the 1951 races. Drivers considered county Highway X too dangerous. The previous year saw a few off-course incidents into a hazardous landscape. Drivers protested officials for a course change, which bypassed the perilous highway. 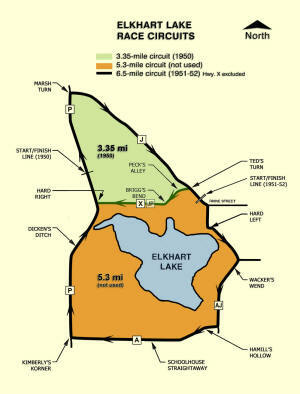 The second Elkhart Lake circuit (5.3-miles) in Section 30, was changed because CTH X was too dangerous by drivers. Start/Finish was initially located on Lake St. but was moved. The 6.5-mile course incorporated part of the original 3.35-mile circuit. Start/Finish was relocated in town on Gottfried Street (CTH J) near the feed mill. The course ran southeast and turned directly south onto Lake Street, then into the Hard Left and a right sweep near along the eastern shore. A right turn went onto CTH-AJ going south past Wacker's Wend, then west onto CTH A past Hamill's Hollow along Schoolhouse Straight. Next was a right turn at Kimberly's Korner onto CTH P. The highway ran north 2.3 miles through a stretch called Dickens' Ditch, a bend and the intersection at the west end of CTH X. Continuing north on P there is a bend before the 90-degree east onto CTH J at The Marsh Turn, an immediate bend goes southeast back toward the village, passing by Ted's Turn (east end of unused CTH X), back into town on Gottfried Street and across the finish line by the feed mill. 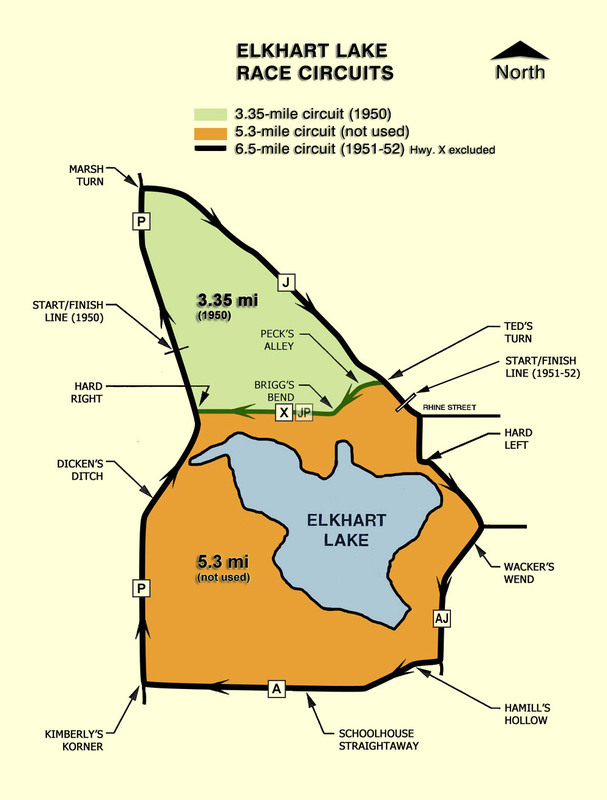 Elkhart Lake circuits used in 1951 and 1952, showing the 6.5-mile course created by connecting the 3.35-mile (green) with proposed 5.3-mile (orange). Start/Finish was located in the village on Gottfried Street. 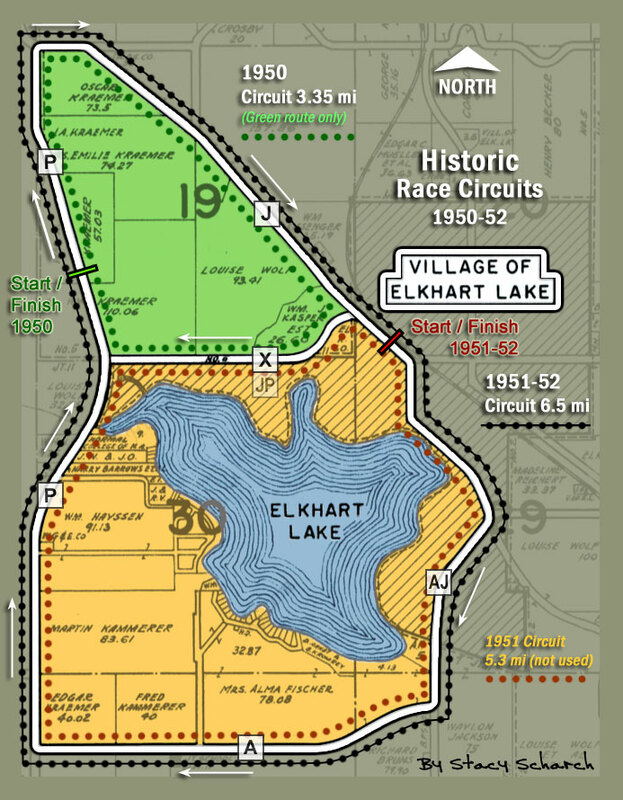 On February 17, 2006, the Elkhart Lake Road Race Circuits was placed on the National Register of Historic Places. This historic marker sign was donated by the Milwaukee Region SCCA, who helped organize the early road races. Circuit map with corner names. The only corner used all three years was The Marsh Turn at CTH P & J on the north end. 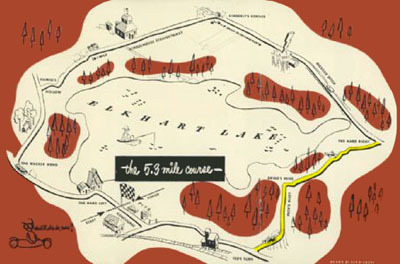 The entry form for the 1951 Elkhart Lake races included a bird's-eye map of the 5.3 mile course. It was printed before a last minute course change. CTH X (highlighted in yellow) proved unsafe for racing after a few off-road incidents in 1950. Start/Finish is shown on Lake Street, which was also not used in '51..
(LEFT) A 5.3-mile route was planned for 1951 and would use CTH X to circumvent the lake in Section 30, Rhine Township. Start/Finish was moved from CTH P into town and is shown on Lake Street. The circuit ran south then turned onto CTH AJ, west on CTH A, north on CTH P, east to CTH X (now JP) then right onto CTH J and Gottfried Street, where it returned to the village and to start/finish on Lake Street. But, the new 5.3 mile course was changed at the last minute before racing began. County highway X (highlighted in yellow) was considered too dangerous by drivers, after some alarming off-road excursions. 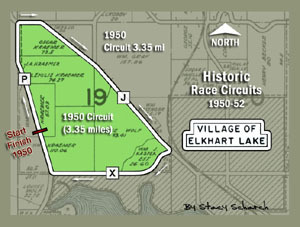 The map (right) shows the final revision made to the Elkhart Lake circuit. The proposed 5.3-mile lake route was connected to the original 3.35-mile circuit at CTH P and J and eliminated the need for the unsafe route down CTH X. The result was a new circuit that was an impressive 6.5-miles long. It was the course used for racing in 1951 and 1952. Start/Finish was moved from Lake St. to Gottfried St. when the route was changed at the last minute before the 1951 race. 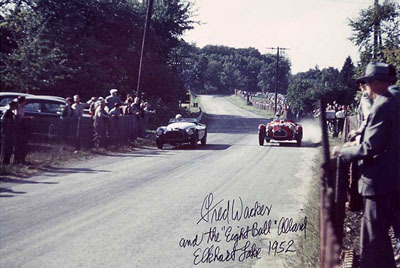 The Marsh Turn at CTH P and J was the only corner used during all three years of racing at Elkhart, from 1950 to 1952. 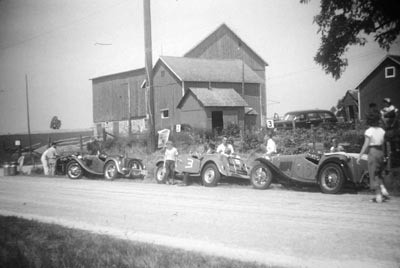 The first road race was a "trial event" organized and conducted by the newly formed Chicago and Milwaukee SCCA Regions. Car owners and drivers were from the Milwaukee and Chicago clubs. Most of the cars were driven to Elkhart Lake, raced and then driven back home. The Chicago Region SCCA planned and conducted the races with support from Milwaukee Region SCCA and local residents of Elkhart Lake. Nationwide promotion of the races attracted race teams and celebrities from across the country. 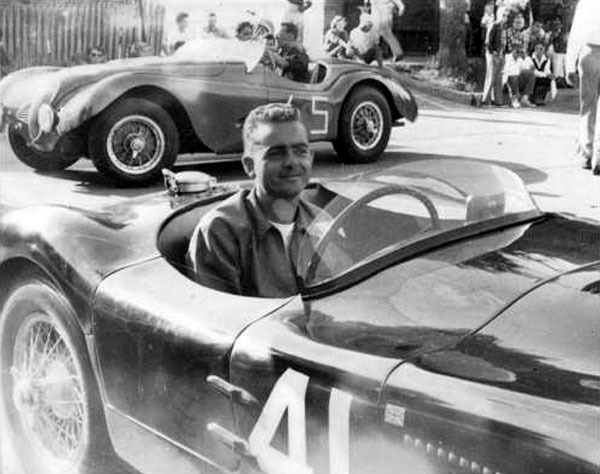 John Fitch, Briggs Cunningham, Phil Hill and a young driver named Carroll Shelby were a few of the entrants. 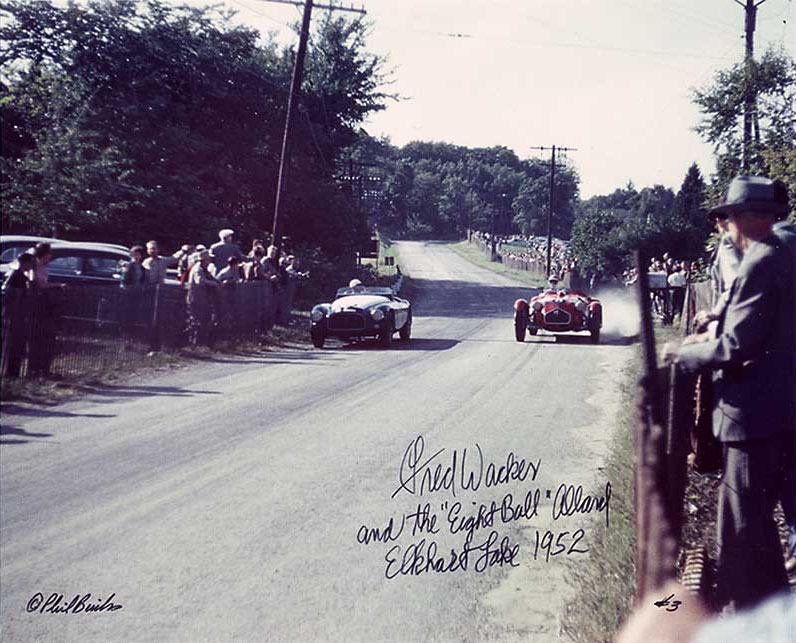 The 1950 race was very successful with an estimated 5,000 or more spectators in attendance, no count was taken. only used in 1951, as was 3.35 mile circuit. The non-championship regional race was held on a 3.35-mile circuit of county roads on the north side of the lake. The start/finish line was located on CTH P and headed north, it turned right onto to CTH J heading southeast, then right onto CTH X (now CTH JP) heading west, and right again where it returned back onto CTH P.
MG's lined up in front of the milk house at the Theel farm on County highway P, before start of race (either Novice or Ladies) on Sunday, July 23, 1950. In middle is car #3 blue MG-TD of Lawrence Whiting, Jr. from Lake Geneva, WI. Behind it is car #18 black/blue MG-TD of George A. Seaverns from Lake Forest, IL. On Sunday, July 23rd there was a total of four races. The first two races were 10 laps each for Novice drivers, one car class for 1500 cc and under and the second for cars over 1500 cc. The third race was Ladies, 5 laps for cars in both classes of under and over 1500 cc. The day was concluded with 20-lap race for Expert drivers with the fastest cars. The first Elkhart Lake Road Race weekend was very successful with an estimated 5,000 or more spectators attending. Planning for a second event the following year had already begun. 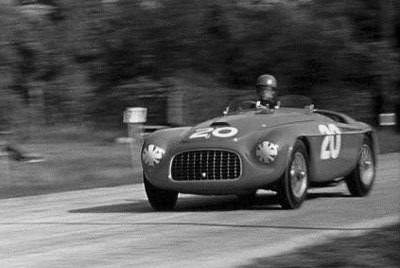 Jim Kimberly in his #20 red Ferrari 166 MM won the 20 Lap (67 miles) main event race on Sunday, July 23, 1950. This was the only year the races were on the 3.35 mile long circuit, down CTH P, CTH J and CTH X (now CTH JP). * Despite same elapsed time, Wacker's Healy was judged to be in front of Feld's Jaguar for the second place finish. 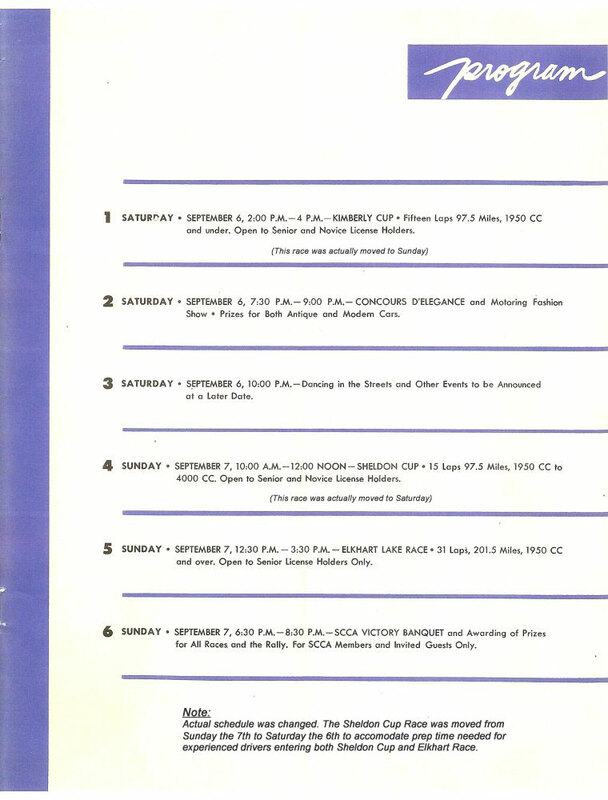 The 1951 races were on Sunday, August 26th. 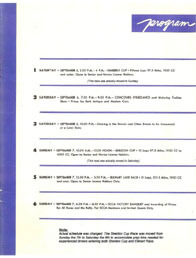 There were three races scheduled with cars divided into four SCCA classes. The first session was a five-lap race (about 32 miles) for novice drivers mixing all classes in the same race. The second event was planned as a ladies race but was cancelled due to threatening weather. The third race was a 30-lap race (about 200 miles) for experienced drivers, again mixing all classes. 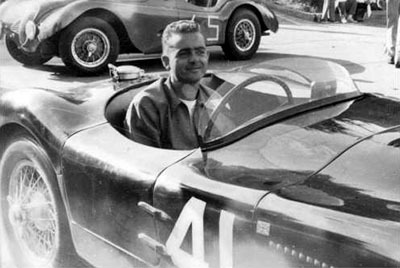 John Fitch, driving a Cunningham CR2, won the race. Although no official attendance records were kept, spectator attendance was estimated to be in the area if 50,000. (LEFT) The 1951 entry form included this map of the 5.3-mile road course. The route wasn't used because CTH X (in yellow highlight) was considered too dangerous by drivers. Start/Finish line is shown on Lake St., but was moved to Gottfried St. when the route was changed at the last minute before the 1951 race. 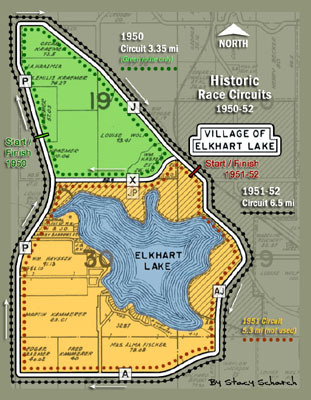 The new 6.5-mile (third) circuit traverses clockwise around Elkhart Lake and through the sleepy village. It was used for two years before the ban on public road racing went into effect. Eliminating CTH X was accomplished by joining the 3.35-mile and 5.3-mile circuits together, which resulted in a course length of 6.5 miles. The first SCCA National Sports Car Championship race at Elkhart Lake was for novice drivers with cars in all classes. It was five-laps and covered a distance of 32.5-miles. The winner was Roger Wing #56 in a Jaguar XK-120 in Class-III. Second place went to Frank Bott #31 in a Jaguar SS100, who finished only one-second behind Wing. 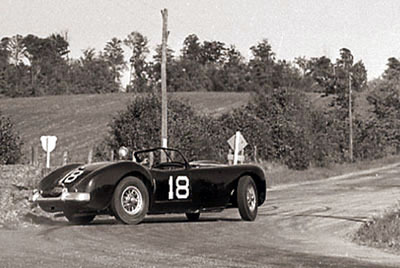 Gordon Lipe #126 also drove a Jaguar XK-120 to a third place finish, just nine-seconds behind the winner. The race was for those who qualified as "experienced drivers". John Fitch drove #128, a Chrysler V-8 powered Cunningham C2-R racing sports coupe. He won the 30-lap, 195-mile race with a time of 02:30:20. The Briggs S. Cunningham racing team brought three C2-Rs to Elkhart Lake's SCCA National the weekend of August 26, 1951. 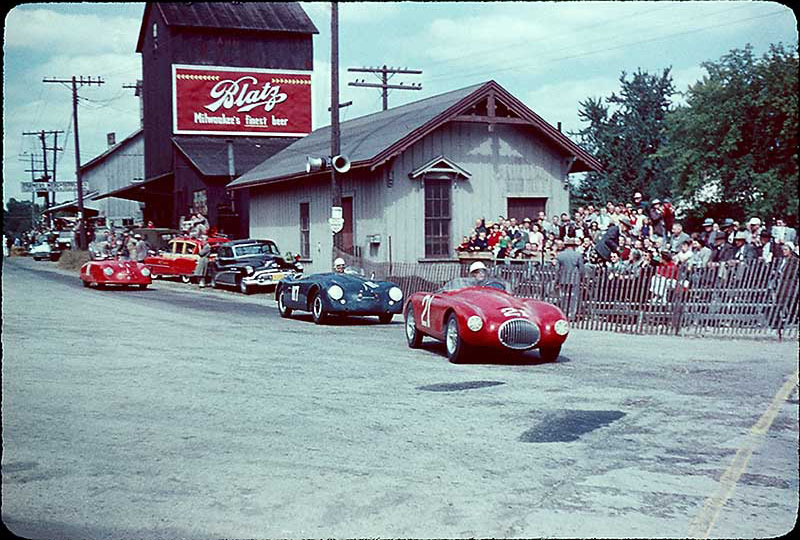 Mid-pack cars by the feed mill on Gottfried Street, following start of the 1951 Elkhart Lake Cup race. The start/finish line is located at the banner in background. Cars shown are Robert Dickens #4 MG-TC (DNF, oil pres. ), Kurt Hildebrand #47 Volkswagen Special (black flagged), Larry Whiting #51 MG-TD (17th overall/5th in class. Paul O'Shea #94 MG later went on to win the second race at first year of Road America. A disturbing example why road racing was banned on public roads after 1952. A spectator strolls across the "hot" course directly in the path of a Cunningham C2-R racecar, during The Elkhart Lake Cup 30-lap race. Race officials and course workers knew enough not to attempt such a stunt. The 1952 races were held over the course of two days. However, the schedule was changed. After the Official Program had been printed the drivers protested that holding the Sheldon Cup Race on Sunday would mean that cars entered in both the Sheldon Cup Race and the Elkhart Lake Cup Race (such as the C-type Jaguar driven by Phil Hill) would have no time to prepare for the second race. The Race Committee agreed, as a result, The Sheldon Cup race was moved to Saturday and The Kimberly Cup was moved to the first race session on Sunday. The first race was held on Saturday, a 15-lap (about 100 miles) event for cars between 1950cc and 4000cc. The race was for the Sheldon Cup, named for one of the race founders C. Bayard Sheldon. Future F1 World Champion Phil Hill won in a C-type Jaguar. Phil Hill #41 won the 1952 Sheldon Cup race in this Jaguar XK120C entered by Charles H. Hornburg, Jr.
Hill was the only American-born driver to win the Formula One World Drivers' Championship. He was described as a "thoughtful, gentle man" and once said, "I'm in the wrong business. I don't want to beat anybody, I don't want to be the big hero. I'm a peace-loving man, basically." There were two races on Sunday. The first event, the Kimberly Cup Race, was 15 laps (about 100 miles) on the 6.5 mile open-road circuit. The race was open to experienced and novice license holders and cars with an engine displacement of 1950 cc and under. The race started in town by the feed mill. 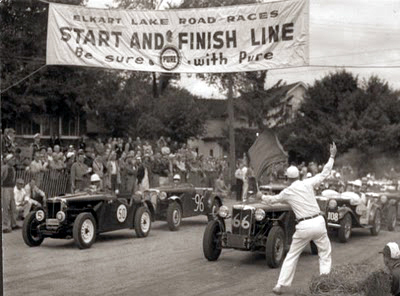 (LEFT) The green flag is waved for the start of the 1952 Kimberly Cup Race on Sunday morning. The start/finish line is located in Elkhart Lake village on Gottfried St. where CTH J arrives. Cars pictured are Gordon Bennett #50 driving a MG TD s/c who did not finish. Norman Carlson #66 MG TD s/c, finished 1st in Class-5 and 9th overall. Starting third is Virginia Schleicher #96 MG s/c. She was the only woman in the race and finished 28th overall. Bob McManus #108 MG, finished 11th in Class-6 for 12th position overall. A nice color photo of Sunday's Kimberly Cup Race on September 7, 1952. 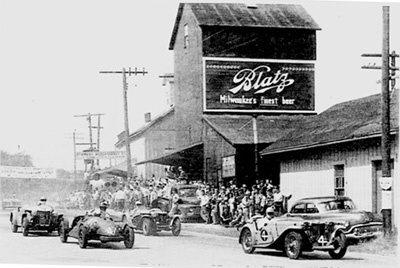 The feed mill with Blatz beer sign is on Gottfried Street (CTH J) and was an iconic symbol for the 1951 and 1952 Elkhart Lake road races. The three sports cars shown are in order of finish. The three-car pack is entering the circuit's first turn from Gottfried St. onto Lake St. after crossing Start/finish about a block down the village's main street. Leading the pack (ABOVE) is William C. "Bill" Spear of Southport, Conn. driving #21 a beautiful red Osca MT4 1350 sports coupe, which won the race. Karl Brocken #117 in a blue Porsche Le Mans, who finished second and 15.2 sec. behind the winner, closely pursues him. In third position is John von Neumann #11 of North Hollywood, Calif. in a red Porsche 356 Le Mans Special. Spear's race time was 01:25:10.2 with an average lap time of 00:05:40.66. His average speed was 68.69 mph on the 6.5-mile public road circuit. 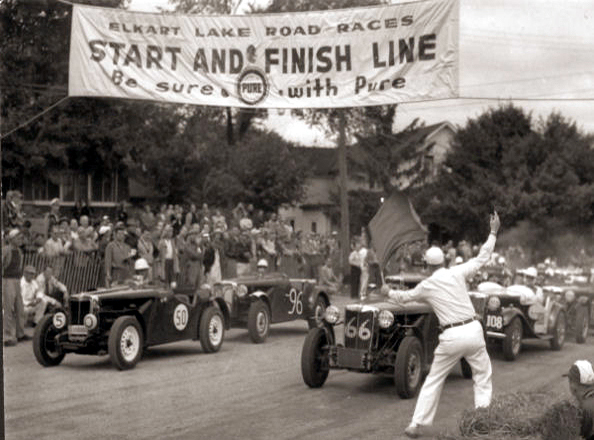 This was the last race held on the open roads of Elkhart Lake. 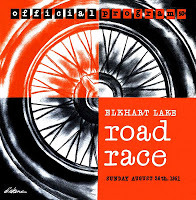 The Elkhart Lake Cup was a 30-lap (about 200 miles) race was open to SCCA experienced license holders with cars over 1950 cc. The green flag was dropped at 12:30 pm on Sunday, September 7, 1952. 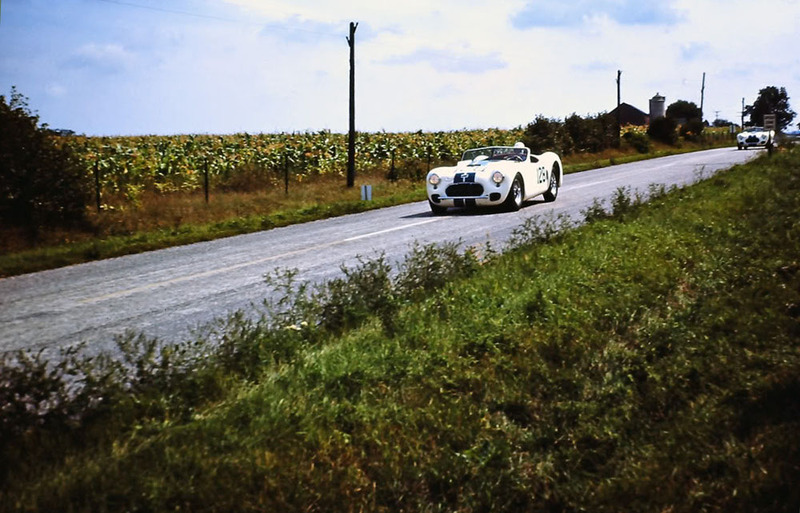 The winner was John Fitch driving #3 Cunningham C4-R, he also won the previous year with a Cunningham C2-R. There were a total of 238 cars entered in all three races for 1952, which were 205 cars more than the 33 entries at Elkhart Lake's 1950 race. Attendance was estimated to exceed 100,000 in 1952. Irving W. Robbins, Jr. #18 of Palo Alto, California in a Cunningham C2-R. Photo looking northeast during Sunday's main race for the Elkhart Lake Cup. Robbins', who finished 10th overall, gets sideways at The Marsh Turn, where CTH P turns east onto CTH J.
Phil Walters #2 finished second in a Cunningham C4-RK Chrysler. B. S. Cunningham Company of West Palm Beach, Florida built the V-8 powered sports car. 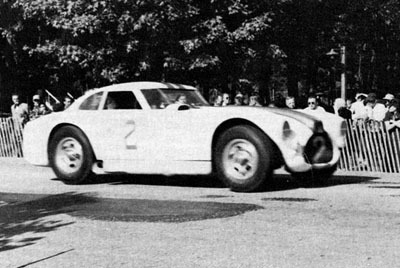 Briggs Cunningham entered three cars in the race. In general, street racing afforded very little protection for spectators and drivers. Snow fence was not enough to deter an errant car or protect the spectators watching from the shoulder of a road. Hay bales did little to stop or absorb the impact of speeding cars. 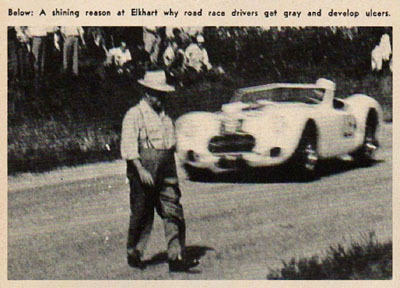 The Milwaukee Journal gave mention of the manner in which spectators were allowed to watch the 1951 Elkhart Lake races. "The thousands of spectators who lined the Village streets to watch the Midwest's biggest sports car road races were forbidden to sit down. This was intended to give them the advantage of a standing start in case an errant Cadillac-Allard started to chase them." 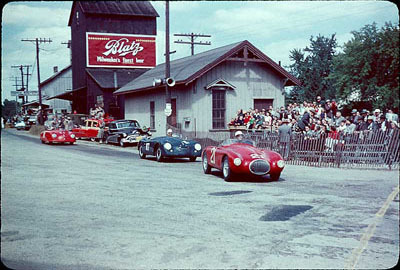 (LEFT) The very last race in Elkhart Lake was the 200-mile main event on Sunday, September 7, 1952. Photo shows the snow fence separating spectators from speeding cars, by a couple of feet. Although there were a few injuries, there wasn't a single fatality in the three years of racing at Elkhart Lake. 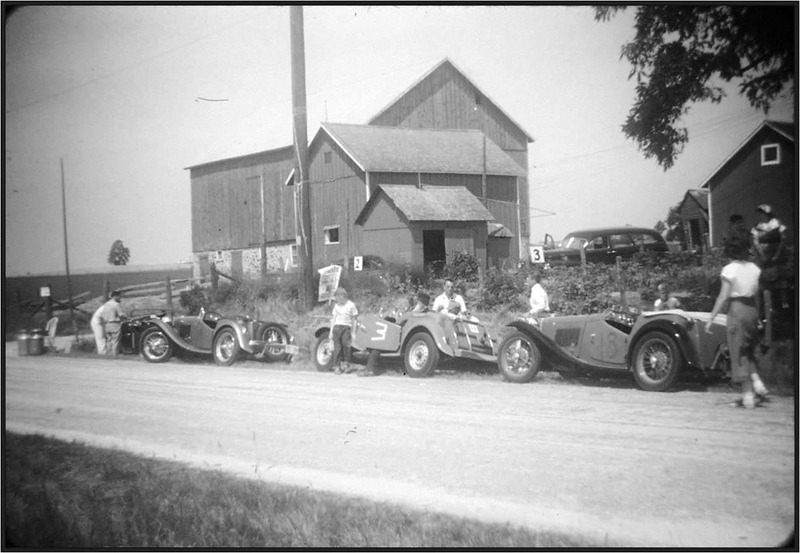 Despite the attention to safety given by race organizers, the car club knew the days of public road racing were numbered. Along with other states, the Wisconsin legislature adopted a ban on public road racing after 1952. One could argue that it was a timely decision. Just three years later, the worst disaster in motorsports history occurred in France during the 24 Hours of Le Mans. Eighty-three spectators and one driver died, while 120 more were injured, when a car catapulted into a crowded grandstand, where it broke apart and burst into flame. The only barrier that separated the track and spectators at the time was a 5-foot high wall of hay bales. In three short years, Elkhart Lake's road races had become a major event for the growing Sports Car Club of America's national championship series, which attracted drivers and celebrities from everywhere. 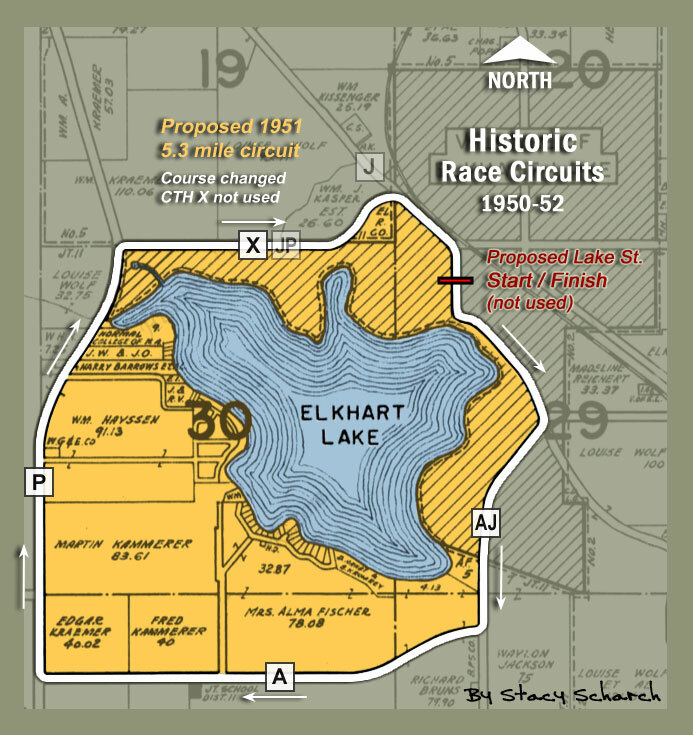 But, the Elkhart Lake area would not see another race for three more years. The big challenge of what to do next was faced by the car club and local business leaders. The same group of individuals who brought motorsports and a second life to small village was not ready to quit. It would not be the end of road racing for the Elkhart Lake area, or the disappearance of thousands who came to watch. A new venue was needed for the growing popularity of organized competitive road racing. In 1955, one of the first purpose-built, premier road racing circuits in America opened its gates. Understandably, the track was given the name Road America, and was located just two-miles down the road from the old lake circuit. Road racing returned to the area once again, where it has remained since. The Village continued as a center for gatherings of sports car enthusiasts. Concours and car club events are often held on the streets where sports cars once raced. These events frequently include formal police-escorted reenactment tours of the historic circuits. Many car clubs and individuals informally tour the circuits throughout the year. The rumble of sports car engines are still heard, where vintage racecars once roared. 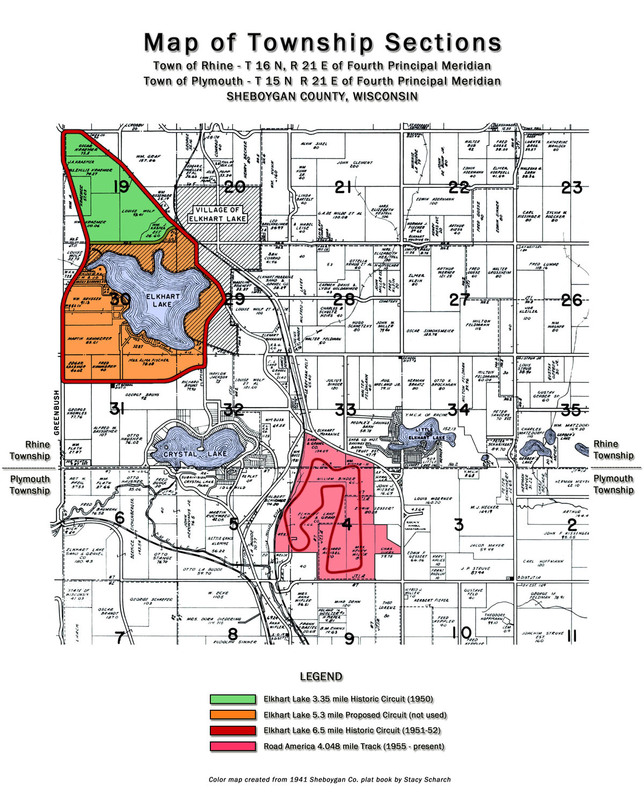 Map showing vicinity of Elkhart Lake and Road America in eastern Wisconsin. Road racing moved just 2-miles south on State Highway 67.